Lovers of the king of fruits can now satisfy their cravings at lower prices, thanks to an unexpected bumper crop. Durian sellers across the island say prices have fallen by as much as 40 per cent within a month. 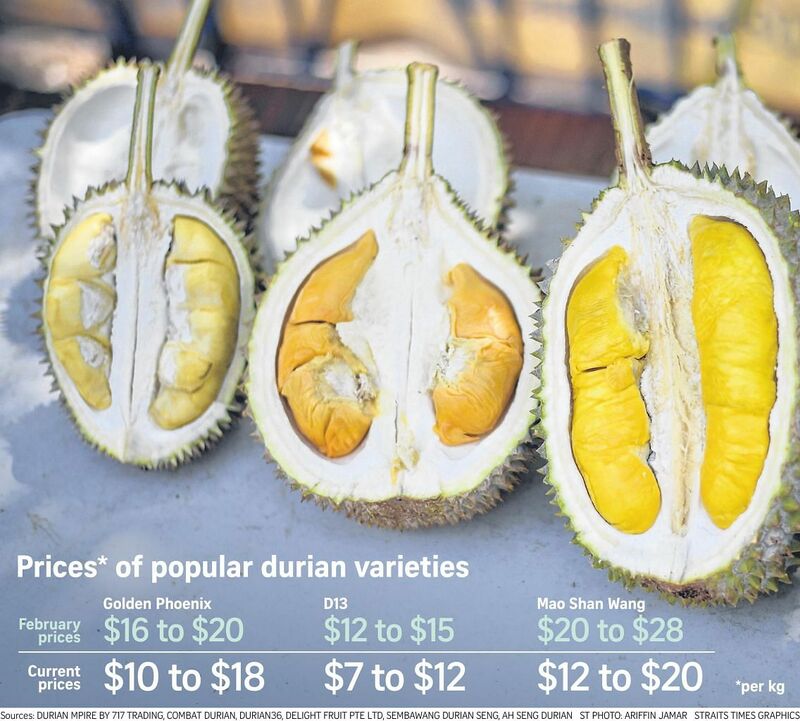 Popular varieties of durians, like the Mao Shan Wang, are now going for $12 to $20 per kg, down from $20 to $28 last month - and a drastic reduction from the highs of more than $40 last year. The durian season is typically from June to September, with various types of durians grown in different parts of Malaysia peaking at different times. However, hot weather in Malaysia has produced a bumper crop this month, particularly in the southern parts of the peninsula, such as Johor. The lower prices are welcomed by customers as well as vendors, whose businesses were affected by the exorbitant prices last season. Mr Sam Ong of Delight Fruits said his durians now sell out on Saturdays and Sundays, even though weekend prices can be 20 to 30 per cent higher than those on weekdays. Mr Goh Kwee Leng, 67, who runs Durian Mpire by 717 Trading in Yio Chu Kang, said prices are unpredictable, as they depend on external factors like the climate and demand from China, which tends to raise prices. Demand had also been affected by a post-Chinese New Year slump and people not knowing about the current bumper season. About six customers were at Durian Mpire when The Straits Times visited on Monday, but the number was nothing compared with the queues of over 10 people that can form during peak seasons, said Mr Goh's son, Mr Goh Ming Hong, 43. Still, the younger Mr Goh, who dropped out of school at 12 to join the business, is encouraged by the quality of the month's output. "Sometimes we tell people not to buy if the quality is not good," he said in Mandarin. "But now, all of it tastes good, so it's OK."
As this durian season gains momentum, some sellers forecast that prices will continue to fall. Others, however, believe prices could return to normal as soon as next week. Some sellers predict a peak season in the middle of the year, which could see prices fall even further. On Monday, Chinese daily Lianhe Zaobao quoted a durian seller as saying that sustained good weather could significantly increase supply - and hence lower costs - in July. Meanwhile, Singaporeans are enjoying the bargains now. "I'll be sure to get some this weekend," said Mr Nabil Danil, 19, a full-time national serviceman. "I'm really excited as I can get more durians for less." Others are not as keen. Said manager Gina Seh, 39: "I'll buy only when I feel like eating. "I wouldn't buy just because the price has dropped." Others, like civil servant Tan Wei Wei, 33, are deterred by the "heatiness'' of the fruit. "The price drop is great, but I don't think I will be consuming it any time soon as I'm still feeling very 'heaty' now, and the weather hasn't been helping."